Location: /Strings/Mandolin/Octave Mandola/OCTAVE MANDOLA. MEDIUM GAUGE. DOUBLE STRUNG.13 - 48. LOOP-ENDS OR BALL-ENDS. Tuned G. D. A. E.
Most players of the mandola choose phosphor bronze wound because of the bright sound they produce, nickel wound strings produce a more mellow tone. Please indicate in the options box below if you would prefer nickel or phosphor wound, loop or ball-ends. Order 4 sets and receive a 10% discount (£5.60). If you do not require 4 sets, tick 'No Thanks' in the options box. 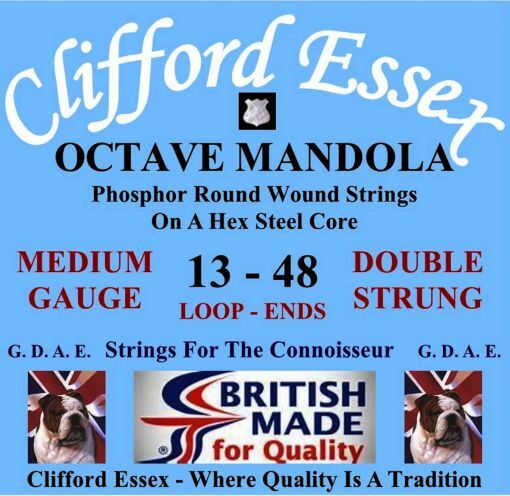 Strings 4 Sets - 10% Discount (+£36.40) No Thanks.